Voyager* 1 has become the first man-made object to exit the heliosphere and reach interstellar space. Oh, wait, it hasn't quite left yet. xkcd keeps count. But since it was launched in 1977 it has certainly travelled a long way: it's currently more than 18.5 billion kilometres from the sun, 124 astronomical units, or just 17 light hours or 0.002 light years. Space is big. *For some reason - the end of a long working day; I'm an idiot - I originally typed Viking 1. Viking's lander is still on Mars, and its orbiter is still circling the red planet (although since it can no longer adjust its orbit, it will crash onto the surface in 2019). 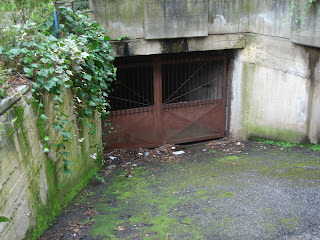 As previously noted, my new short story collection, A Very British History, will be published at the end of this month. There will be a standard or trade edition, and a signed, limited edition with endpaper artwork by Jim Burns and additional material in a separate slim book, all in a slipcase. The table of contents of the standard edition can be found here; the limited edition also includes two short stories, Karl and the Ogre, and Searching for Van Gogh at the End of the World, and a biographical essay, My Secret Super Power. Both the trade edition and the limited edition are available for preorder; there will be only 100 copies of limited edition, so if you want to grab one, you'd better be quick. It sounds like pulp hokum, but in fact it's much more interesting, a serious attempt to depict actual space travel, and actual conditions on the Red Planet. There are no canals or ancient civilisations, no mighty minds bent on conquering Earth or kidnapping Santa Claus, no rock snakes. Instead, as in George Pal's earlier Conquest of Space, Mars is a bleak desert world, lacking almost all the resources required for human survival. There are aliens, yes, but like the astronaut they are visitors. But while Conquest of Space dates from the dawn in space travel, in 1955, Robinson Crusoe on Mars was disadvantaged by being made in 1964. American astronauts and Russian cosmonauts were preparing to go to the moon; within a year Mariner 4 would beam back pictures of the Martian surface, bleak and cratered and utterly lifeless, with an atmosphere thinner than previously suspected. 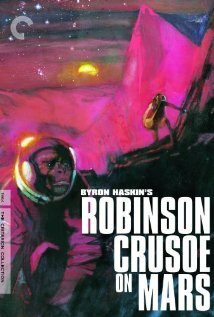 All science fiction dates, but Robinson Crusoe on Mars was very swiftly overtaken by reality, and has dwindled in the rearview mirror of history into little more than a cult curiosity. That's a shame, because there's an awful lot to like. The story of survival, adapted with full acknowledgement from Defoe's original by screenwriter Ib Melchior, is strong and compelling. 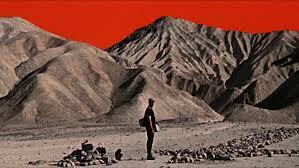 Much of it was filmed in Death Valley; with red skies matted in, the landscapes in which astronaut Commander 'Kit' Draper (Paul Manatee) struggles to survive are vastly bleak and bear more than a glancing resemblance to real Martian scenes imaged by probes and rovers. And Manatee gives a fine performance of a genuine hero, given to moments of despair and self-doubt, but resourceful, thoughtful and likeable, determined to make a go of it even though there appears to be no hope of rescue. Draper and Dan McReady (Adam West) are surveying Mars from orbit when their spacecraft is fatally damaged by an encounter with an erratic planetoid. They eject in separate escape capsules and crash-land in a harsh landscape where fireballs blow about like dust devils. Draper survives, and discovers that although McReady was killed on impact, their pet monkey, Mona, is still alive. Like Crusoe he learns how to live off the land and create a bubble of civilisation in the midst of indifferently hostile nature; like Crusoe, his idyll is interrupted by a violent intrusion, in this case aliens who have come to Mars to mine minerals using slave labour. But while the film's realism is ruptured by the appearance of alien ships equipped with rock-blasting ray guns, it doesn't turn into a pulp shoot-out or a crude assertion of human superiority, but becomes something much more interesting. One of the slaves (Victor Lundin, in Biblical Egyptian wig, loincloth and sandals) escapes; Draper christens him Friday and removes his shackles; they strike up an alliance that, despite their complete lack of any common language, soon turns into deep friendship, rather than the master-servant relationship of Defoe's original. Draper is very much an American hero, a Navy astronaut who hangs the Stars and Stripes outside the entrance to his cave shelter and plays Yankee Doodle Dandy on a home-made flute, but he doesn't attempt to imprint his own values on Friday, and although he's equipped with a revolver he never resorts to violence, and learns that the key to survival is cooperation and trust. Like the Apollo astronauts, he comes in peace, for all mankind: a useful reminder that not all science fiction stories need to be resolved by gunplay and spectacular explosions, but can aspire to something more adult, more human.